Firefighter James Austin Murray raced to the third floor fire escape, climbed through a window and found himself engulfed in a yellow smoke so thick visibility was zero. Murray stumbled through the floor and started breaking windows . The smoke and heat cleared out of the floor, letting the firefighters with hoses see what was happening. There had been choking smoke, blistering heat, real danger in this fire in a paint factory. And there was real pleasure and relief in all that for Murray, New York City firefighter for a half dozen years. It was his first fire since September 11th, and, after a month of grief, he was happy to get back to doing his job. He didn't have to think about September 11th -- "for the first time I just thought about doing my job." And he did not have to go, for that one night, to any funerals. The terrorist attacks have cast a pall over the New York fire department like no other group in the city. The Police Department and Port Authority lost significant numbers, 23 for the police department, 37 uniformed officers for the Port Authority. But 343 firefighters died. Every day, fire men and women have been lining up outside of churches in their blue suits, polished buttons and white gloves. Last week they had the 300th memorial service for a firefighter since September 11th. Funeral services are scheduled to go on for weeks. "I've been to at least 20 funerals," said Murray, who is now with Squad 18 in Manhattan. "On my days off, I try to make two or three a day. But there are times when you need to step back from it all." 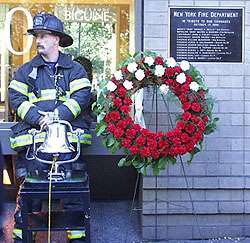 "There are firefighters who have gone to a funeral every day since September 11th," says Roscoe Brown, a Lieutenant with Ladder 165 in Queens. "I don't even want to count how many I've been to." As wrenching as the funerals are, the effects of the World Trade Center tragedy on the Fire Department go beyond the lives lost. A number of high ranking officials died, and with them leadership and institutional knowledge. Every firefighter lost friends, many lost family, and psyches are damaged. Are you subject to fits? Do you know the three R's? Are you expert in defibrillation techniques? Compare the requirements for firefighters from 1887 and 2001 and see if you qualify for New York's bravest. At the same time, firefighters have received what must surely be unprecedented recognition and rewards for their valor. Always viewed as brave, they are now regarded as heroes and seen as a symbol of the city's courage. Billy Blazes is an action figure modeled after a New York firefighter and is one of this holiday's best sellers. New Yorkers have turned from cynics into adoring fans, spontaneously and loudly offering thanks to firemen at their houses, in the streets, and in bars across the city. When two firemen came into a bar in Chelsea late November, the other patrons bought their drinks for the rest of the night. Fire and police representatives are still honored at sports events across the country. In a New Yorker cartoon a mother asks her daughter, "But, sweetheart, why do you have to marry a doctor? Why can't you marry a fireman?" But when rescue and recovery efforts are finished and the city's focus turns to rebuilding, will the public forget the heroes? "I don't buy into the admiration thing," says Charles Jennings, an associate professor of fire science at John Jay College of Criminal Justice. "For a couple of months they'll give firefighters the respect they deserve. Then they'll move onto another fad." Whatever happens, the Fire Department will be left with the problems it had before September 11th, except now many have gotten worse. The rift between the firefighters and Fire Commissioner Thomas Von Essen has created ill will that his successor will be forced to deal with. The overwhelmingly white, Catholic, male Fire Department has been under pressure for years to become more diverse, more representative of the city. [See Jane La Tour's article]. The Emegency Medical Services personnel have muted their complaints about their treatment as new members of the Fire Department, but those complaints have not gone away. And even in financially flush times, there was talk of closing some firehouses, because effective fire prevention and safety had reduced the number of fires that needed to be fought. Now, bad economic times threaten to make matters worse. The last time there was a fiscal crisis, in 1975, budget cuts reduced the department by 32 fire companies. Firefighting was largely done by volunteers for the first two and a half centuries of the city's history, and as dangerous as it was, there was no problem getting new recruits. The job of a volunteer firefighter offered recognition, comraderie, and, sometimes, political power In the decades before the Civil War, volunteer companies were the first step on the political ladder for seven New York City mayors. The mix of politics and firefighting was so bad that at the scene of fires, companies would ignore their duty and engage in brawls, even sabotage other companies' equipment. By the 1860s, the close ties between Tammany Hall and the volunteer companies as well as increasing losses from fires, led to the state legislature replacing the volunteer companies with the city's first paid force. Losses due to fires plummeted. Since then, the firefighters have often been lauded for their professionalism. But their passion for the job remains. The job description of running towards a fire forces a firefighter to go against a very basic human instinct. But firefighter after firefighter say they love their job and a large part of that passion arises from the bond between them. Firefighters talk about each other as brothers. "You can't get any closer than a fireman with another fireman," says Eugene Striffler, who retired as a captain in Brooklyn in 1978 and whose son, Donald, is a captain in Manhattan. "You eat together, you might as well say you sleep together. Your life depends on me and my life depends on you." Until September 11th, whenever a firefighter died on the job, nearly every firefighter in the city would turn out for the funeral. During a Father's Day fire this past year, where 3 firefighters were killed, an estimated 10,000 firefighters showed up. The unity is also national. When six firefighters died in Worcester, Mass., in 1999, an estimated 30,000 firefighters from across the country came to the mass. At the time it was the worst firefighter death toll in a building fire in 20 years. Firefighters say that when someone in the department dies, it is like a family member dying. Multiply that by 343, and the emotional impact is palpable in the firehouses (especially the 75 firehouses in which at least one member died on September 11th). Firefighters are worn out from funerals, from searching for their friends and other firefighters. And sometimes, that emotion spills out. When the mayor wanted to decrease the number of firefighters searching through wreckage at Ground Zero, firefighter unions and many firefighters felt this would mean less effort would go put into recovering bodies. Mayor Giuliani said that the presence of so many firefighters on the scene created a safety hazard. Negotiations broke down, and the firefighters marched to Ground Zero. Their protest ended in confrontations with police, harsh words between the mayor and union officials, and 18 firefighters and officers arrested, though charges against all but one were later dropped. "A lot of firemen felt they were misunderstood when they were arrested," says Brown. "There are over 200 firemen's remains, 200 occupants in this tomb. We know the city has to move forward, but our duty is to the families of those that perished. Not only the firemen, but the civilians too." Mayor Giuliani said he recognized the firefighters were under enormous stress. But he said, "No matter how bad you feel, no matter how much you feel like crying, and no matter how much you feel like venting your emotions," the confrontational tactics were not acceptable. Grief counseling is being offered to the firefighters, with an extra $3 million earmarked for that purpose, but it is not clear how many in the department are taking advantage of it. "Most of the time, firemen turn to each other, family, and friends, but mostly to each other," Lieutenant Brown said. "Different people deal in different ways," James Austin Murray said. "A lot of these guys aren't the type to run to the doctor��|. Some people exercise more, some talk to their wives more and some people drink more." The firefighters were still trying to heal when Flight 587 crashed in Belle Harbor, Queens, a community where many firefighters live. Five Belle Harbor residents were killed, and 260 bodies had to be pulled from the wreckage of Flight 587. A block away from the crash site, the local church had just held its 12th funeral for a victim of the World Trade Center attack. Firefighter Brian Harvey of Engine Co. 236 said, "It's just devastating. I think the whole department is kind of numb. You're still thinking about what happened at the trade center, and then something like this happens." A firefighter at a bar in Belle Harbor told the Times, "All this job is anymore is pulling bodies. Any more and I'm going to crack up." Through this, a new group, called the 9-11 Widows and Victims' Families' Association, has emerged. The group ultimately got the mayor to increase fire department presence at the World Trade Center and they are likely to have a voice in the rebuilding effort. By some estimates, the Fire Department lost a combined 4,000 years of experience when the towers collapsed. Peter Ganci, the chief of department and highest ranking uniformed fire officer, died along with William Feehan, the first deputy commissioner, as well as 22 battalion chiefs, 21 captains and 47 lieutenants. "The amount of knowledge lost is staggering. There were some real experts, who knew things about fires, building safety, that no one else knows," said Glenn Corbett, a professor of fire science at John Jay College and technical editor of Fire Engineering magazine. One man, Ray Downey, battalion chief of the Special Operations Command, was a nationally respected expert on fires who helped set up the nation's Urban Search and Rescue Network. Andrew Fredericks, a firefighter in Squad 18 did research on firefighting hydraulics, nozzles, and fire attacks. The list goes on and on. A new chief of department was promoted, along with six battalion chiefs to the rank of deputy chief, and 29 officers rose to battalion chief from the rank of captain. In the days after the tragedy, a total of 168 firefighters were promoted to help fill holes in the command structure. A class of 240 graduated from the fire academy at the beginning of November. Like most of the classes before them, those promoted were almost all white. In 2000, of the 10,860 members of the New York City Fire Department, 94 percent were white, 3 percent were black and 3 percent were Hispanic. Part of the disparity can be explained because the job is passed down from father to son. "Traditionally, the best recruiting tool has been the family dinner table," says Lieutenant Brown, who has no family in the department but approves of the tradition. "It only makes sense that you need someone who knows about it to get you interested." Defenders of the department say that the selection process is blind to family name and racial and ethnic makeup; what matters, they say, is performance on entrance tests. Detractors, like members of the Vulcan Society, an organization of black firefighters, says that the Fire Department needs to work harder to recruit in minority communities. Of recent applicants, 22 percent were from minority groups, compared to 7 percent in 2000. Also, on October 12, after a heated internal debate, the department hired its first Muslim chaplain. But Edward McMellon, one of the four police officers involved in the shooting death of Amadou Diallo, became a fireman in November. His defenders said that since he and the other officers were acquitted of criminal charges and since his test scores were one of the highest in the class, he qualified to be a fireman. Critics saw it as just another example of the department's racism. Considering the racial makeup of the fire department, accepting McMellon was a controversial decision. Nevertheless, as McMellon walked across the stage at graduation, fellow probationary firefighters and their families gave him a loud round of applause. Fire Commissioner Thomas Von Essen has already announced he will not seek to be reappointed in the new administration.. As Von Essen became a national symbol of courage to many Americans, fire fighters attacked him, and the rift between the commissioner and the rank and file deepened. During an appearance on David Letterman, Von Essen received a standing ovation. A few weeks later he was booed by firefighters during a live, nationally broadcast benefit concert at Madison Square Garden. The rank and file charge that Von Essen, a former president of the Uniformed Firefighters Association, belittles them. He has made statements that rankle many. "I compare them to the fun you have when you're in high school," Von Essen said during a television interview after September 11th. "It's a team spirit... . You get to sit around all day and, you know, say the commissioner doesn't know what he's doing." Thomas DeParma, the Queen's trustee for the Uniformed Firefighters Association, said his members are "furious" with the commissioner: "They don't appreciate Von Essen being on TV and comparing them to high school seniors, like he is the principal." Some critics call him a tyrant in the way he runs the fire department. His supporters counter that Von Essen has modernized the Fire Department, overseeing the merger of the Emergency Medical Service with the Fire Department, and increasing the safety of firefighters and civilians. Employees of the Emergency Medical Services, which were incorporated into the Fire Department in 1996, however, complain they have less prestige and receive lower salaries than Fire Department employees. Firefighters, for their part, complain about a system where firefighters trained in CPR and the use of a defibrilator are called to medical emergencies. While firefighters get extra pay for this, many of them do not like it. A new contract is also being negotiated, and unless Mayor Giuliani and the unions can come up with a deal, the next commissioner and Mayor-elect Bloomberg will have to address these concerns. Regardless of a contract though, the commissioner will also have to deal with the diversity issue and try to have a better relationship with the unions than Von Essen has had. Perhaps above all, the new commissioner will have to oversee the examination, and even criticism, of decisions made at the World Trade Center on September 11th. Some observers have said that no one outside the immediate area was watching the fire and communicating with the command post, which was inside the building. (This is normal operating procedure.) Some question the aggressive tactics of the fire department. Most fire departments fight fires from outside the building, while New York's attacks them from inside the building. Von Essen has said outsiders will have to be brought in to conduct the assessment, something that has never been popular with firefighters. "We have the greatest firefighters in the world, but the department does not have the mechanism to competently or honestly evaluate itself," Von Essen said. Salvatore Cassano, the department's chief of operations, said, "There may possibly be a fire in the future where we will have to say we cannot fight this fire at this time. We are doing risk assessments now for each type of operation. This event has never occurred. No one thought it would ever occur." For now though, the memorial services continue, with the last one scheduled for the 15th of December, more than three months after the casualties. There are still the living firefighters to worry about, and appreciate, and something will have to be done to help them cope. Firefighter James Murray is an artist as well as a firefighter and usually, his paintings are what he uses to deal with the stress that comes with being a firefighter. But after the 11th, he says he did not have the focus required to paint. Instead, he started a project, along with a businessman, that collected and exhibited photographs from everyday people. For a time, he found some comfort in helping run the exhibit, called the September 11th Photo Project. The walls are white at the gallery, the floor creaky, and the pictures are contributed from New Yorkers. The viewers are silent. There are the photos of the towers collapsing and civilians crying. But there are also the photos of stalwart firefighters marching in bunker gear toward a white-washed world of chaos. Firefighters leaning on each other at Ground Zero. Flowers and candles in front of firehouses. For many, these will be the images remembered from that day. For Murray, though, it has become too difficult to spend time at the gallery. In the beginning working at the gallery helped focus his emotions someplace. But later it all became overwhelming. "I'd go to a funeral, I'd go to work, I'd turn on the television. Every where I was, it was there." So now he is not coming around the gallery as often. And he has a new policy about funerals. From now on, he will only be going to funerals of friends or family of friends. Lately, he has only been going to two or three a week. The Vulcan Society, a black firefighters organization. The Unofficial FDNY website, run by FDNY Deputy Chief Vincent Dunn. The Fire Station bookstore, for books about firefighting. Adopt A Family -- With the holiday season fast approaching, this site looks to lessen the burden for the New York City firefighters who lost so many members.